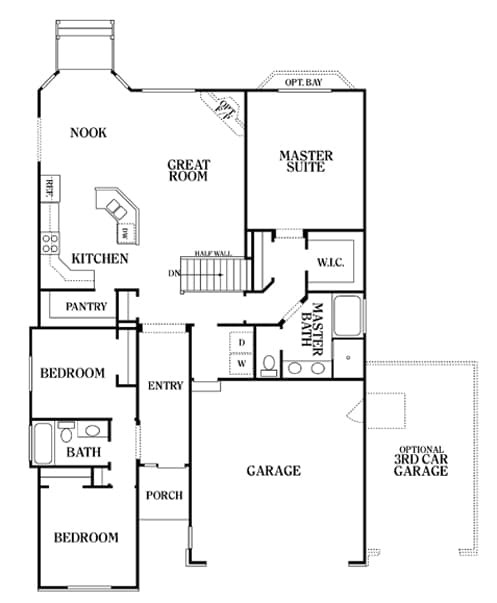 "The Raegan is the perfect rambler home for homeowners who want an expansive floor space. Since it has a finished floor area of 1,575 square feet, it can easily accommodate 2 bedrooms, 1 bathroom, and a master suite that comes with a master bath and a roomy walk-in closet. It also features a large living area where the nook, great room, kitchen, and pantry are located. Plus, its initial design can be improved by adding several home upgrades like a fireplace, a bay window in the master suite, and a garage. With Perry Homes Utah, you can rest assured that building your dream Utah home won’t stress you out. Our company has been in the heritage home building business for more than 40 years, and we specialize in providing a seamless and hassle-free house buying process that’s catered to your needs. We’re also known for constructing top-notch rambler and two-story houses at an affordable price. Plus, we’re dedicated in helping you every step of the way to ensure that your home will remain in perfect condition. Contact Perry Homes Utah so we can start building your dream Utah home today. Our design center personnel will be more than happy to walk you through our collection of rambler and two story home designs, as well as a variety of exterior and interior customization options. We also provide extensive and transparent financing options, so you can feel financially secure when constructing your perfect Perry home. If you’re interested to know more about our house designs and house buying process, please give us a call at 801-264-8800.